On Friday, November 4, a ceremony was held at China's Hebei Medical University (HEBMU) in celebration of the 30th anniversary of the establishment of their partnership agreement with Shinshu University. Five faculty members from the latter institution, including Vice President Kiyoshi Tanaka and School of Medicine Vice Dean Mitsuhiko Yamada, attended the ceremony. 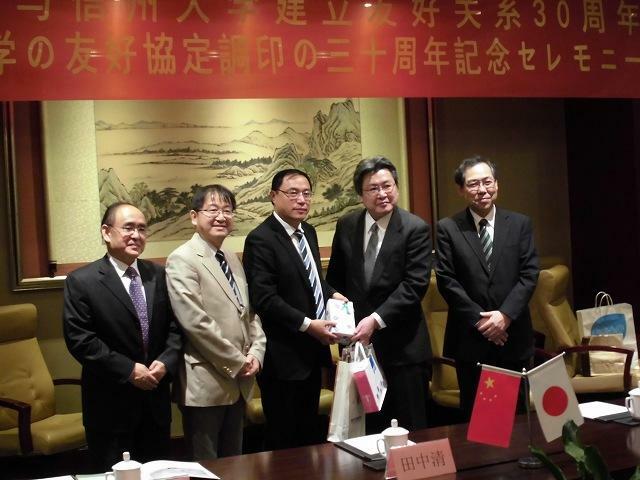 Prior to this celebration, the representatives from Shinshu University and HEBMU President Cui Huixian held a meeting at which they discussed global education and activities among other topics. Looking toward the future, both universities pledged to pursue even more active inter-university exchanges and joint efforts. In the afternoon, Shinshu University Professor Tatsuo Suzuki held a special lecture for HEBMU students titled "Memory and Synapse: Molecular and Structural Basis for Memory Mechanism." Large numbers of students and teaching staff attended, and participating students listened with deep interest while asking numerous questions. The lecture was extremely rewarding as both an educational exchange and research-related exchange event. This latest courtesy visit by Shinshu University representatives provided a superb opportunity for members from both institutions, who had already established deep-reaching ties of cooperation, to further develop their inter-university relationship and strive for more active exchanges and joint efforts in the future. Representatives from Shinshu University, Matsumoto Dental University and Tottori University in Japan were welcomed to the celebration by numerous teaching staff and students at HEBMU, and the ceremony was a great success. Following opening remarks by HEBMU Vice President Duan Huijun, Shinshu University Vice President Tanaka and visitors from other universities expressed their gratitude, and HEBMU President Cui Huixian provided a general summary of events and activities. Tanaka discussed the globalization occurring in countries around the world and resultant demand for solutions achieved through the cooperation of people from numerous nations. Regarding Shinshu University, he talked about the opening of the Global Education Center and efforts toward the fostering of global leaders. Moving forward, he emphasized the importance of sustaining and strengthening existing frameworks for cooperative efforts between HEBMU and Shinshu University.